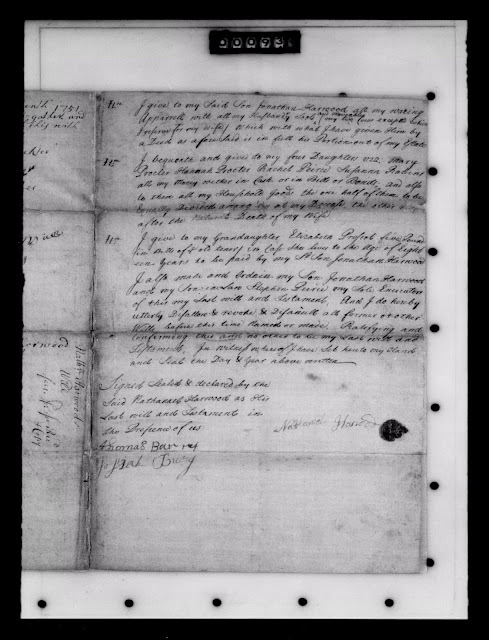 Genea-Musings: Amanuensis Monday - 1744 Will of Nathaniel Harwood (1669-1751) of Chelmsford, Mass. Amanuensis Monday - 1744 Will of Nathaniel Harwood (1669-1751) of Chelmsford, Mass. to take and accept of at my Decease. a Deed as aforesaid is in full his Portion out of my Estate. after the Natural Death of my wife. een years to be paid by my s^d Son Jonathan Harwood. and Seal the Day & Year above written. 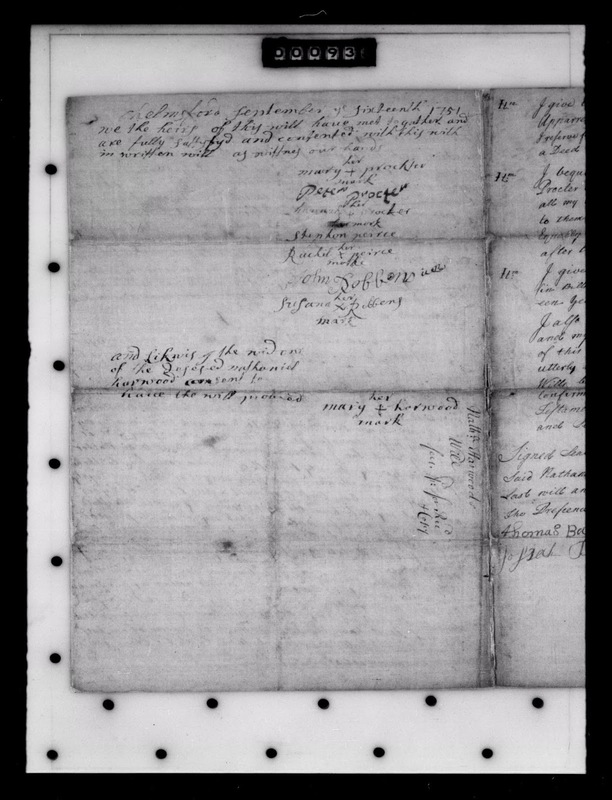 "Middlesex County, MA: Probate Papers, 1648-1871," digital image, Ameircan Ancestors (http://www.AmericanAncestors.org : accessed, 26 November 2016), Probate packet No. 10629, Nathaniel Harwood estate, will written 1744, estate probated 1751, 9 pages. Nathaniel Harwood and his wife, Mary (Barron) Harwood, had 7 children, and five of them are named in his will - Mary (Proctor), Hannah (Proctor), Rachel (Peirce), Susanna (Robbens), and Jonathan. In addition, he named his granddaughter Elizabeth Prescott. 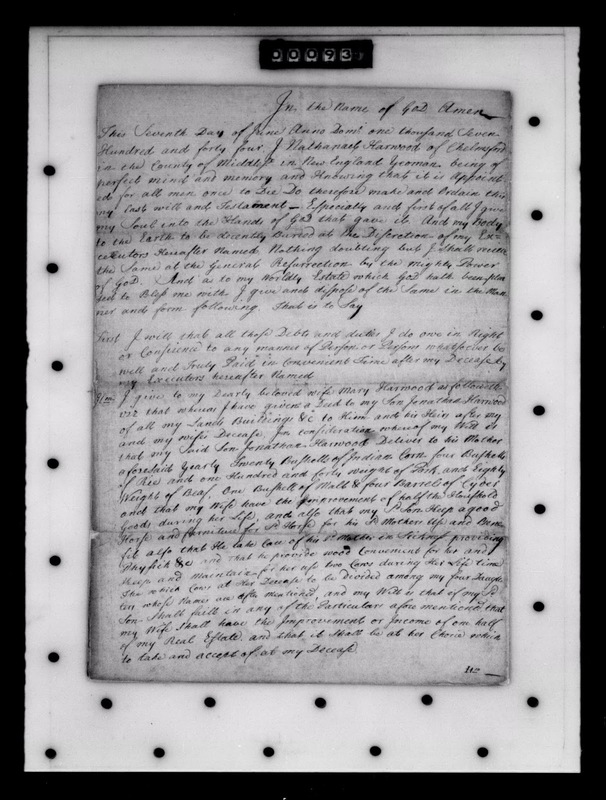 Although he did not name Elizabeth's mother, Elizabeth (Harwood) Prescott (1701-1739), who married Jonas Prescott (1703-1784), this is Indirect Evidence that Elizabeth (Harwood) Prescott is the daughter of Nathaniel Harwood, and Direct Evidence in an Original Source with Primary Information that Elizabeth Prescott (1734-1812) was his granddaughter. These documents are images of the Original Source records in Probate Packet No. 10629 for Nathaniel Harwood. There are documents for a bond, a Letter Testamentary, an Inventory and an Account in the 9 papers in the Probate Packet.